• Learn to Implement Advanced Instructions like Data Movement, Comparison, Collect, Data Transfer, BCD/Binary Math, Floating Point Math, Shift Instructions, etc. The student should have experience programming Omron PLC’s and should be familiar with the CX-Programmer programming software. 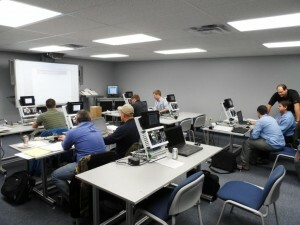 Prior completion of the Basic PLC CS/CJ Training Course would be very helpful, but not required. • Functions, Function Blocks and other programming techniques commonly used in a project. • Learn to Master Advanced functions for Data Movement, Comparison, Data Collection, Data Transfer, Data Shifting used for advanced sequencing, Arithmetic functions with Integer and Real Numbers, etc. Course Fees are due at time of registration. Fees include training materials, equipment, lunch and promotional items. For those students bringing their own laptops, they must have at least IBM AT compatible machine, Celeron 540 1.8 GHz or faster processor, 512MB Video Card or higher, 2.5 GB free space, 2 GB of RAM, Windows XP (SP3 or higher), Windows Vista or Windows 7/10 (32-bit or 64-bit edition), a working serial port, mouse and DVD-ROM. Please be mindful that the student must have Administrative Privilege upon arriving to class if CX-Programmer or Sysmac Studio is not already installed. If attending a training session using Sysmac Studio and CX-One is already installed, please be mindful that a minimum of CX-One V4 is required to co-exist with Sysmac Studio. There is a $300 charge for laptop rental fees. Class size is limited to 12 students. Registrations are accepted on a first come, first serve basis.